Lahore-Exact To be disclosed to pass holders only. "In a game of poker, I can put the players' souls in my pocket." You Guys Ready To Have A Night Of Bless. Let The Poker Lord Be Kind On You. 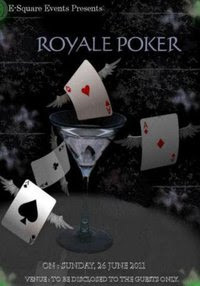 We Are Giving You The Opportunity To Enjoy A Whole Night Experience Of Royal Poker. *In the Final Round, The Same Path Has To Be Followed And The Last Man On Table Will Be The Winner. 1K Chips Will Be Given To Every Player In Every Round. Will Be Given To You On The Table. Plus Get The Wildest Party At The End Of The Event. And If You Are Not A Poker Freak Then You Can Enjoy The Dance Floor And Exciting Number Games. *Registrations will be closed on 24 June. *Management Reserves the right to cancel registration of any.